As this is being written there is around 18 hours left in the final match of the Aperiodical’s Big Internet Math Off between Matt Parker and Dr. Nira Chamberlin. In honor of the final Samuel got on the phone and talked with the creator of the Math Off Christian Lawson-Perfect about where the idea came from and what it has been like to run. Samuel also got a hold of Dr. Nira Chamberlin who was kind enough to take carve out some time from a busy schedule at a new job to take a call from Samuel to discuss what it has been like to take part and make it to the final of the Math Off. After the episode originally went out Samuel was able to get in touch with Matt Parker for a discussion of Matt’s unique strategy in the competition and why breaking voting systems can be fun. 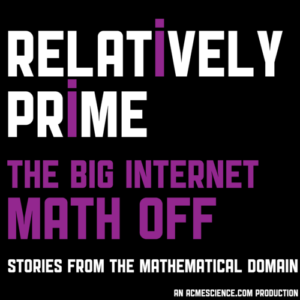 Please enjoy this episode, and make sure to hurry up and vote in the final match of the Big Internet Math Off.